We’re still in October fellows, but 2011’s world champions, in terms of Death Metal, have already been revealed. In fact, we’ve known the winners for months, probably since May. By that time, Miasmal had just released its first self-titled album and Disma was only recording its debut, Towards The Megalith. And the 2011 Death Metal Champions are... DISMA & MIASMAL! These two bands are completely different. Disma hails from the US and was formed by former Incantation and Funebrarum members. Needless to say the expectations were high, and everyone was anticipating the debut album, that just HAD to be tremendous. A few months before releasing that first record, the band was involved in a fabulous 7” Split with Winterwolf. The vinyl was released via Doometia Records and had that AWESOME artwork. Now as you imagine, everything was set for Death Metal fans to witness the birth of a dominating Death Metal band. Especially that the demo called The Vault Of Membros released in 2009 had a massive impact on the underground. Now is this a fantastic artwork or is this a fantastic artwork? And yes, no one was disappointed when they heard “Of A Past Forlorn” on the split EP with Winterwolf. 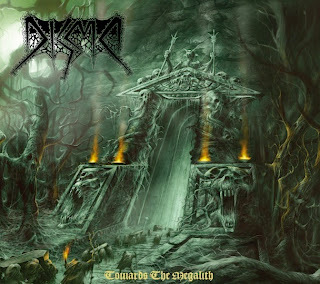 And when the album came out, with it’s superb artwork, on Profound Lore (another “hype” factor) everyone agreed that this would be this year’s best Death Metal record. Musically speaking, we should even say DOOM Death Metal. Disma’s music is unbelievably massive, not always slow though as there are some pretty frantic accelerations here and there. I think the main word is DYNAMIC. And there’s nothing more important that dynamic when it comes to extreme music. The headbanging is mandatory, you just can’t help it, the sound is oh-so heavy and there is some kind of awesome and creepy atmosphere that totally fits the band's ambition in terms of "concept" (artwork and lyrics). All in all that record makes me think of a better version of Runemagick. Really dominating and powerful stuff. I can't pick up a specific favorite song on this one, but you guys must try and listen to the awesome “Chasm Of Oceanus”, “Lost In A Burial Fog” or “Towards The Megalith” (not to mention the already known "Of A Past Forlorn"). The other 2011 champion is more surprising. 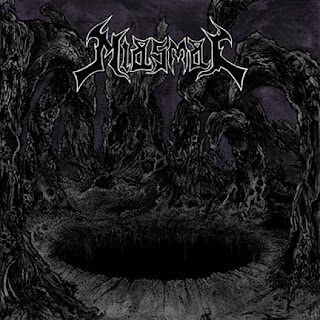 Miasmal hail from Gothenburg, Sweden and they have released their first CD on Dark Descent Records in May. From the first listen I knew that Miasmal was a special CD. In fact, the first 2 minutes from opening track "Mesmerized" are enough to tell you how fantastic this band is. The atmosphere is creepy, humid. Feels like the music has really been recorded in some cave. The drums groove like hell and the fast riff will blow your head away. Swedish Death Metal at its best! The album is a succession of instant hits, and each track stands out in it’s own way. Some tracks like “Mists” or “Death Mask” are just irresistible. The album is just as great as Disma’s and it’s impossible to determine which one is stronger, especially that Miasmal is more typically Scandinavian. Also note that the CD version of the album includes the tracks from the sold-out band's demo. 14 tracks of pure Death Metal pleasure. These two CDs are just the illustration of what old-school Death Metal should sound like, and they are just perfect in their own way. You like Death Metal? Then there is no way you can miss any of these two amazing releases. Now before some of you start insulting me, note that I have picked 2 new bands. But of course, one must not forget to mention the godfathers, as most of them are still around. And no, Im not going to discuss the controversial Morbid Angel record. This year, in my opinion, another death metal pioneer was back with an unbelieavable release: AUTOPSY. What a return! Filthy, raw, heavy, doomy and totally insane: that’s how Macabre Eternal sounds like. The final track, "Sadistic Gratification" is completely insane, and Reifert’s voice is just like the Devil himself is whispering in your ears. Young wolves are taking over? Maybe, but some of the Godfathers are still hungry! Now that said, who still believes that Death Metal ain’t what it used to be??? It’s still Alive (or Dead shall we say) and VERY WELL!